Years ago when living in Michigan my best friends daughter had the most beautiful baby layette made with the puff shell stitch shown in this project. Her neighbor, an avid crocheter had crocheted it for her. 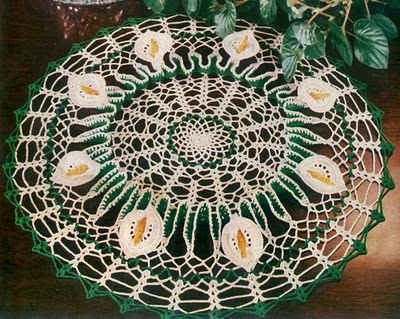 I asked and begged her neighbor for this pattern but she would never share it with me or even tell me where I could get it! Luckily I came across the pattern a couple of years later. The puff shell stitch has been my inspiration for many patterns like the Puff Shell Poncho and Puff Shell Coat. 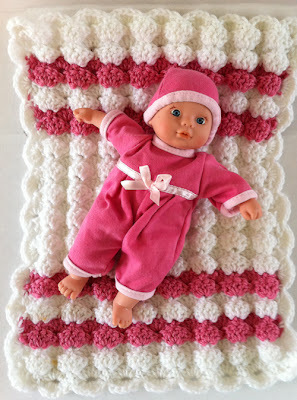 It is a very beautiful and simple crochet pattern stitch that is easy to do. All Shells are worked in back loops of sc. All single crochet stitches are worked in both lps. Row 2: Ch 1, turn, sc in first dc, working in back loop only, Shell in next sc, * sc in center dc of next Shell, working in back loop only, Shell in next sc; rep from * across, ending with sc in last dc. Row 3: Ch 3, turn, working in back loop only, 2 dc in first sc, sc in center dc of next Shell, * Shell in back loop of next sc, sc in center dc of next Shell; rep from * across, ending with 3 dc in back loop of last sc. At the end of Row 3, change color to Pink. Rows 4-5: With P, rep Pattern Rows 2-3. At the end of Row 5, pick up White. Rows 6-7: With W, rep Pattern Rows 2-3.
at the end of Row 7, pick up Pink. Rows 8-9: With P, rep Pattern Rows 2-3. At the end of Row 9, pick up White. Finish off Pink and weave in ends. Rows 10-21: With W, rep Pattern Rows 2-3. At the end of Row 21, change color to Pink. Rows 22-27: Rep Rows 4-9. At the end of Row 27, pick up White. Finish off Pink and weave in ends. Rows 28-30: With W, rep Pattern Rows 2-3 once and Pattern Row 2 once more. DO NOT FINISH OFF. Rnd 1: With W, ch 1, turn, with right side facing, working in Row 30, Shell in back loop of first sc, * sc in center dc of next Shell, Shell in back loop of next sc; rep from * across, ** working in sides of rows, evenly work alternating sc and Shells 10 times, ending with sc in last row**, working in unused lps of starting ch, Shell in first ch, sc in ch opposite sc of Row 1, (Shell in ch opposite Shell of Row 1, sc in ch opposite sc of Row 1) across, ending with Shell in last ch; rep from ** to ** once more; join with sl st to first dc. (38 shells) Finish off and weave in ends. We recently have been making a lot of updates/changes to the site and moving the blog over to WordPress. Perhaps you caught us in the middle of a revision. Are you still experiencing issues viewing the site? There were some errors viewing the site in older web browsers such as Internet Explorer version 7 or older that are no longer supported. This should be corrected now, though I would recommend making sure your browser is updated to it’s most current version. Please let us know if you are still experiencing this issue. I also would like to make a larger size afghan did i do my math right is it a multiple of 3 plus 3? please help i am alittle slow being male and all. thanks for putting this outhere for us all. Hi Maggie – Thank you so much for sharing with all of us!! This is just gorgeous and I’m sure that my grand daughters (4) will just love it!